Buffalo Gap is one of the most gorgeous places in all of Virginia, and we like to think that taking care of your trees adds to it. At Staunton Tree Service, we have the equipment, tools, knowledge, and insurances that are needed to keep it that way – with integrity. We offer the Buffalo Gap area all of the following tree services, as well as many more. If you need anything done to your trees, give us a call and we can talk you through the process. 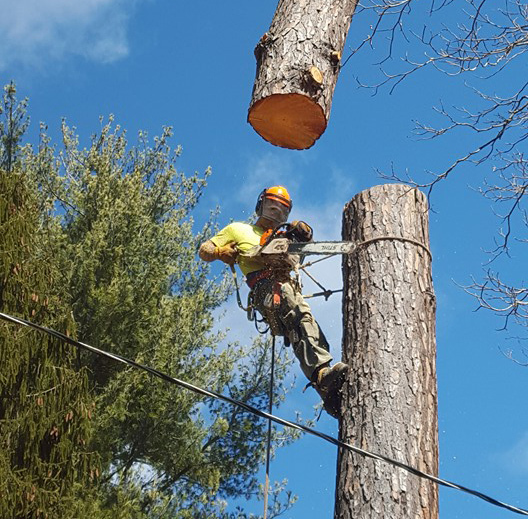 Use the form below to request a free estimate on your tree service needs in Buffalo Gap, VA.
Buffalo Gap tree removal isn’t as simple as it might be as in some other places. The tighter quarters and minimal space between homes, cars, other trees, and structures makes it a tedious job that requires precise cuts, falls, and placement. Doing it by yourself isn’t an option. At Staunton, we have the team members that can tell you where a tree will fall within inches. Our equipment ensures that everything operates perfectly, and we clean up after we are done. Give us a call today and we can give you an estimate based on your individual trees. A lot of people don’t get their trees trimmed until their insurance company tells them to or there is a bad storm coming, but you shouldn’t wait. Trees can’t just grow without some guidance as to where to go and what to do. A certified arborist can help your tree stay safe with tree trimming and pruning, but even more, they can help with shade production, fruit development, and even help them grow more quickly. The whole process doesn’t take long, but it has long-lasting results. If you have a tree removed, you might think that the job is done, but that just isn’t true. You will likely still have a stump left over that sticks out from the ground and is a nuisance. You could end up with pests and diseases from the stump invading your yard, or you could ruin your lawn mower or leg by running into it. Stump grinding is the only real way to treat all of the problems associated with a leftover stump. Ensuring that your trees are healthy doesn’t only save you from some pretty costly bills down the line, but it also gives you peace of mind that you are safe from infestation, diseases, and sudden falls. Our tree health inspections don’t only find problem areas, but if they do exist, we will then help you fix the problem. We can also help you find any areas that could become a problem but aren’t yet. Our experienced team will look at every square inch of your property to ensure safety and health. While we don’t always get a lot of storms in Buffalo Gap, they can be pretty dangerous. Trees falling into your yard, onto power lines, or into the streets can really do a number on you. They also might not be safe for you to cleanup. Staunton helps with the cleanup, and can ever repair broken or splintering trees. It is best to leave all storm damage cleanup to the professionals, so give us a call as soon as you need our services. Buffalo Gap might be a small town, but that doesn’t mean they don’t deserve the best quality tree care around. Staunton Tree Service will give you that big town experience and qualifications for a smaller town price.